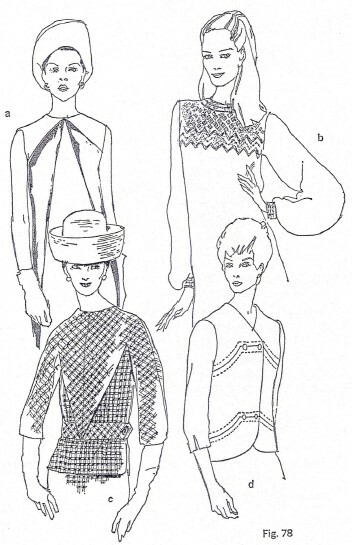 If you have to stitch two or more sections of a garment together to form a complete front or back unit, why not make decorative use of the parts and the seaming that joins them? In design a degree of repetition makes harmony. * The eye is pleased to see a line it has met before. In Fig. 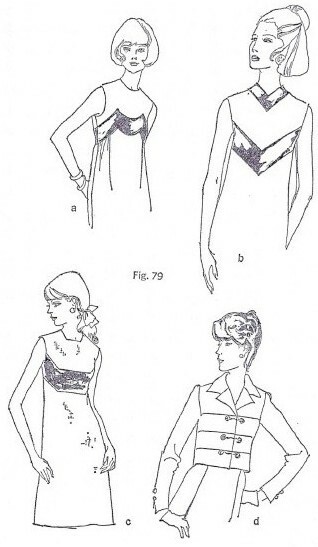 79, each of the designs features a pair or trio of similar seam lines. One of the seams is a control seam. The other has been added for emphasis. Can you tell which carries a dart control? Yes, it is the one that comes closest to the bust point. In Fig. 79a, the dart control appears in the lower seam. The width and shape of the band are in no way altered. The upper seam is purely decorative. On the bodice- front sloper, draw the style lines of the band 9 (see page 110). Make them parallel. Notch both styles lines. Cut the section apart. Shift all or part of the waistline dart control to the lower seam. In Fig 79b, the inset band developed in the same way. Despite the straight appearance of the lines, they are slightly curved to conform to the shape of the body. 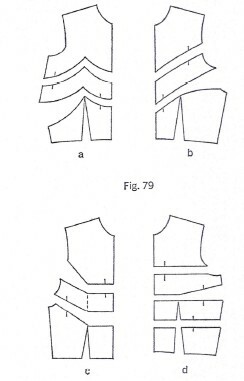 In Fig 79c, it is upper seam that is the control seam. This pattern is easier to plan on the bulging block than on the flat sloper. 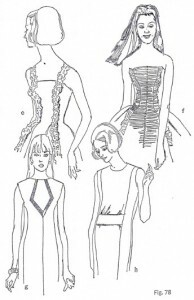 repeat the line of the control seam for design interest. 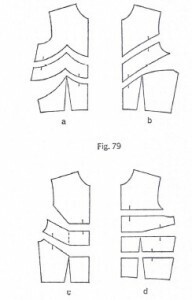 The forgoing discussion of control seams has with the bodice front. 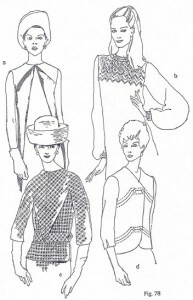 the principles illustrated work as well in a bodice back, in a skirt, and in a sleeve.